How are Australia’s states and territories performing? 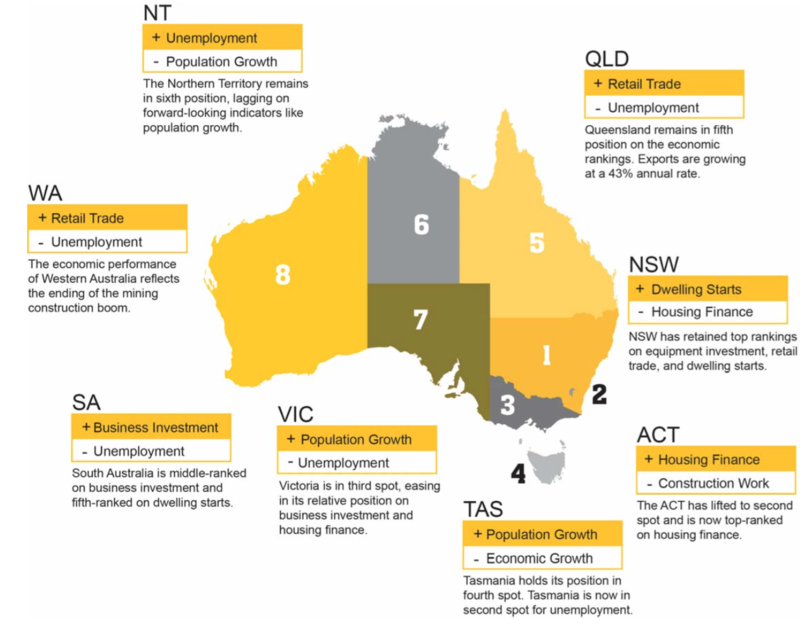 Each quarter CommSec attempts to find out by analysing eight key indicators: economic growth; retail spending; business investment; unemployment; construction work done; population growth; housing finance and dwelling commencements. · Just as the Reserve Bank uses long-term averages to determine the level of ‘normal’ interest rates; we have done the same with key economic indicators. For each state and territory, latest readings for the key indicators were compared with decade averages – that is, against the ‘normal’ performance. · The State of the States report also includes a section comparing annual growth rates for the eight key indicators across the states and territories as well as Australia as a whole. This enables another point of comparison – in terms of economic momentum. · NSW has solidly held the position as the best performing economy, at or near the top on all indicators. · The ACT has moved into second spot, improving its relative position on five of the eight indicators. · Victoria has eased to third spot on the economic performance rankings but there is little to separate the state from the ACT. · Tasmania remains in fourth spot just ahead of Queensland, Northern Territory and South Australia. The rankings haven’t changed in the last quarter. · Western Australia continues to lag other economies and annual growth rates remain below national averages on all indicators. · NSW remains solidly on top of the economic performance rankings. Last quarter we said that NSW may experience a challenge from either Victoria or the ACT over the coming year. And that remains the case. · The ACT has now lifted to third spot in the performance rankings. And economic momentum is on its side with firmer population growth, low unemployment and solid residential and engineering work. · Victoria has eased to third spot on the performance rankings. But it continues to lead the nation on population growth and employment growth has lifted. · NSW, Victoria and ACT represent the top-tier of economies with little to separate the economies in the second tier. · Tasmania remains in fourth spot with rising population growth (fastest in five years) boosting housing demand and supporting the job market. · Queensland is in fifth position but there is little to separate the State from Tasmania, Northern Territory and South Australia. Tourism, exports and housing activity are driving the Queensland economy. Post-flood rebuilding and repairs can also be expected. · The Northern Territory remains in sixth position on the performance rankings. The job market is strong but population growth is weak, affecting consumer spending and housing demand. · The South Australian economy retains potential to lift over the coming year. Employment is growing at close to the fastest annual rate in almost six years, lifting retail spending (fastest growth in the nation for monthly series). · Western Australia is benefitting from higher mining and metal prices and record export volumes. Unemployment has also eased over the past three months. Tourism and agriculture both provide scope to drive growth. · Each of the states and territory economies were assessed on eight key indicators: economic growth; retail spending; business investment; unemployment, construction work done; population growth; housing finance and dwelling commencements. · The aim is to find how each economy is performing compared with “normal”. And just like the Reserve Bank does with interest rates, we used decade-averages to judge the “normal” state of affairs. For each economy, the latest level of the indicator – such as retail spending or economic growth – was compared with the decade average. · While we also looked at the current pace of growth to assess economic momentum, it may yield perverse results to judge performance. For instance retail spending may be up sharply on a year ago but from depressed levels. Overall spending may still be well below “normal”. And clearly some states such as Queensland and Western Australia traditionally have had faster economic growth rates due to historically faster population growth. So the best way to assess economic performance is to look at each indicator in relation to what would be considered ‘normal’ for that state or territory. · For instance, the trend jobless rate in the ACT of 3.7 per cent is the second lowest of all economies. But this jobless rate is 0.2 per cent higher than its ‘normal’ or decade-average rate, ranking it fourth on this indicator. · Trend measures of the economic indicators were used to assess performance rather than more volatile seasonally adjusted or original estimates.